One of my favourite places in Yorkshire is Spurn Head. 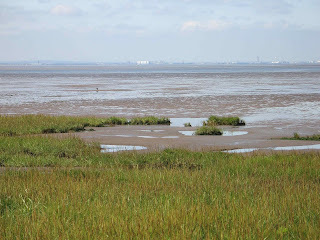 If the Holderness Peninsula is an elephant's head, Spurn would be the trunk. Geologically, Spurn Head is a spit: is a narrow belt of land made of sand and mud at the North end of the Humber estuary. Often, the road that leads to the lighthouse and lifeboat station has to be repositioned after winter storms, as the dunes move and cover it, it shows how dynamic this coast is, constantly subject to erosion and deposition. On a sunny day is absolutely dazzling. The contrast between the colors on the estuary side, bright green and pink-grey, and in the seaward side, sandy and blue is amazing. It also feels wild and exposed, this more markedly in the winter. Spurn is very popular with bird watchers, specially during the migratory season, as it is one of the most important places in the country to see migratory birds. 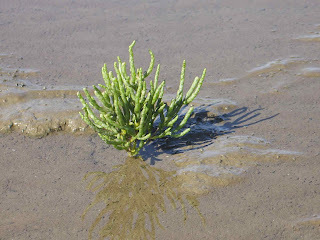 On the Humber side of the spit there are mudflats and near the shore marshes where you can find samphire and sedum. The beach on the North Sea side is mostly sandy, with scattered pebbles and fossils. Beachcombing is always fun. 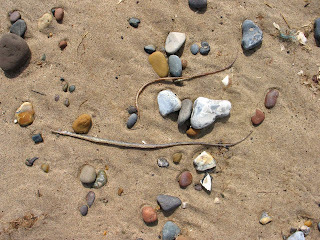 One day we were surprised by hundreds of dead pipefish washed ashore. 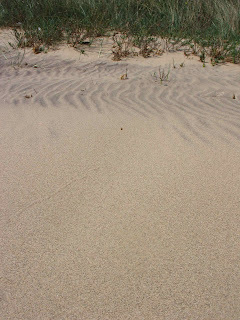 In between both beaches, a narrow line of dunes. 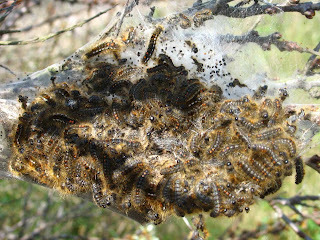 The dunes are stabilised by sea buckthorn, often covered by tents made by caterpillars of the Brown Tailed Moth. 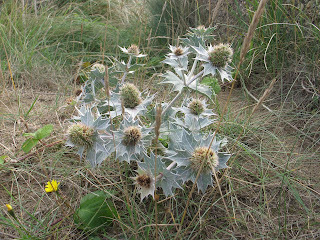 Sea holly is common and in between the buckthorn there are brambles, lesser celandines, orchids and many other flowers. 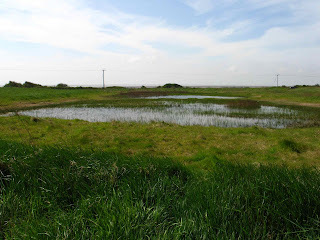 North of the reserve information point there is a beautiful pond called Canal Scrape. This explains the many dragonflies and even newts that can be seen in Spurn. 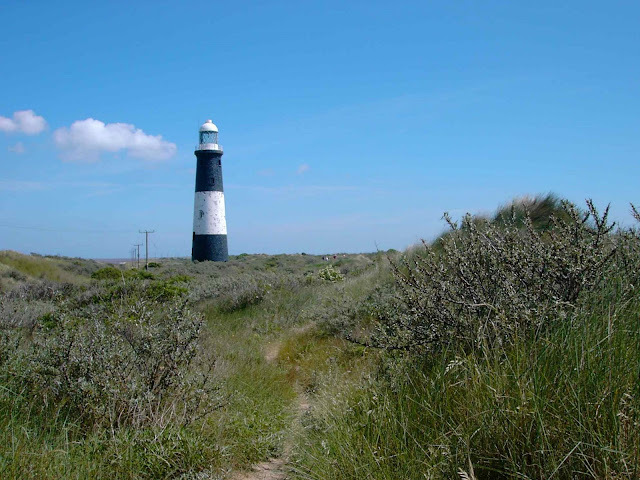 Spurn Head is a wildlife reserve of the Yorshire Wildlife Trust, and cars have to pay a small entrance fee. You can park in the Blue Bell Cafe and walk if you wish, but you will miss something if you don't get to the lighthouse and walk on the beach around the point. Today we are welcome by a wonderful sight: over the bright green marsh, two Little Egrets fly past gracefully. It's the first time I see egrets in this country and what a perfect place to do it. In the fields just before getting to Kilnsea, a roe deer, at midday and in the middle of the field. In the dunes, I watch a few interesting invertebrates. 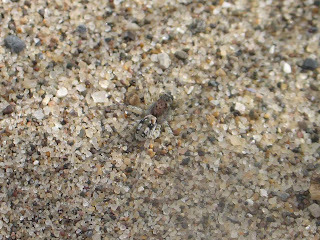 A dune wolf-spider, Arctosa perita, beautifully camouflaged. 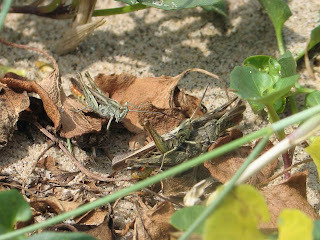 A female grasshopper, Chorthippus brunneus, trying to feed while males do some competitive singing and one of them manages to mate with her. 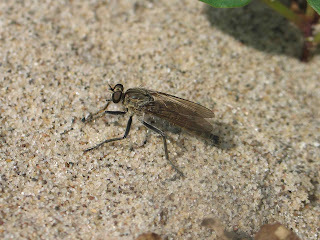 A scary-looking robber fly, Philonicus albiceps. Also, several butterflies: Red Admiral, Small Tortoiseshell, Common Blue and Small White. Spurn Bird Observatory. Full of info with daily sightings. Map and also checklists of moths, butterflies and dragonflies. Spurn Head Nature Reserve. Page of the Yorkshire Wildlife Trust.